Here Are the Ways To Change Language From English in OpenShift Hosted WordPress In Case Your Language is Not English. There Are Many Ways. So far, our Installing WordPress on Free OpenShift PaaS video guide appearing to be somewhat a good hit after a year. There is also easy to follow textual guide to install WordPress on OpenShift. 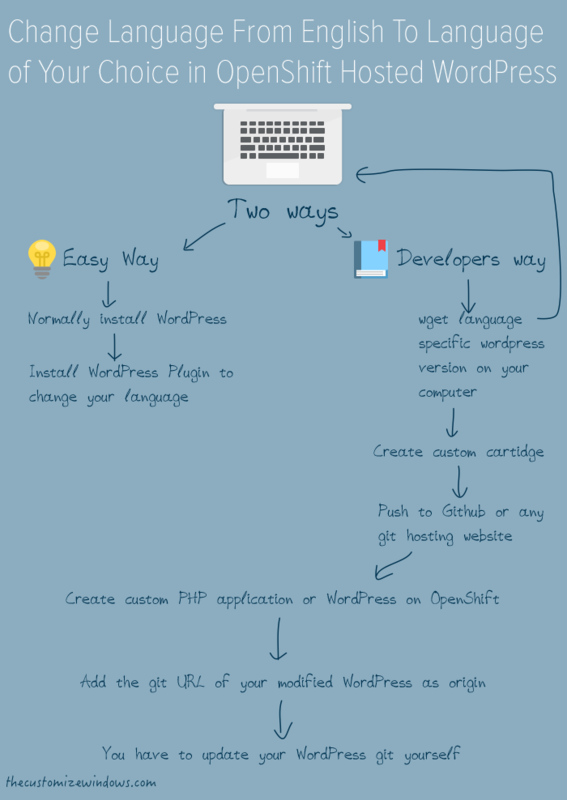 You will notice on the comments part, that one user has asked how to change the language in WordPress from English in OpenShift Hosted WordPress. Not everyone can be expected to have excellent grip on WordPress CMS or command line, so we are clearly pointing towards two major ways – one for users who already running English version of WordPress and want to change it in easy way and another way is a bit difficult. “User Language Switch allows each backend user to set the language displayed in the back-end and front-end of the site.” That is possibly what the users want. But, the basic thing is that; we can not use the usual version of WordPress directly on OpenShift – it is not impossible – one can setup a MySQL database instance and a PHP application instance and use Command Line Tool for Red Hat OpenShift to wget and install custom version of WordPress. We will not talk about OpenShift specific development, that is basically why OpenShift official community is intended for. So, you will wget the language specific version on your computer, make it a git dev app and make the changes, push it to either GitHub or somewhere you love to host the code. Cite this article as: Abhishek Ghosh, "Change Language From English in OpenShift Hosted WordPress," in The Customize Windows, May 29, 2014, April 23, 2019, https://thecustomizewindows.com/2014/05/change-language-english-openshift-hosted-wordpress/.